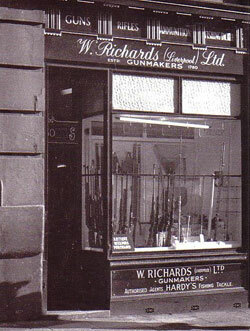 The history of W Richards has connections with gunmaking going back to 1780, and was patronised by royalty from all over the British Empire, including HRH The Prince of Wales, HRH The Duke of Gloucester, and HSH Prince Adolphus of Teck. The company grew to be a very successful business, originally formed in London in 1801, then after a brief spell in Birmingham finally settled in Liverpool, which at the time was a thriving shipping port. They continued to prosper opening a branch in Melbourne, Australia in 1853 and then, further branches in England in Preston, Lancahshire in 1897. Striving forward and building their empire, Richards were producing quality sporting guns and rifles with patents registered in their name. In 1910 Richards purchased Willaims & Powell Gunmakers, which incorporated Patrick, the famous pistol makers, a further acquisition followed in 1924 of James H. Hooton Gunsmiths. Chris Caine purchased the name, goodwill and intellectual property of W.Richards in the late 1990's, relocated to Pocklington, East York where he continues to repair & manufacture guns to order with the finest materials and workmanship as made for hundreds of years by time served craftsmen.